CartEssenza - Papier Maché Jewellery: To wear papier maché? I present you "Louie Louie"! To wear papier maché? I present you "Louie Louie"! To wear papier machè? It's impossible! ""Louie Louie" is the name of a new project in collaboration between the two handmade brands "La Soffitta" and CartEssenza. "Louie Louie" clothes are completely handmade on La Soffitta's design and made unique with the application of CartEssenza's coloured and light recycled buttons in papier maché. Louie Louie Clothing by La Soffitta & CartEssenza, a set on Flickr. My thanks to the beautiful and funny Valli for patience, even despite the cold, and to the wonderful Carolina Ferrando for the photos! 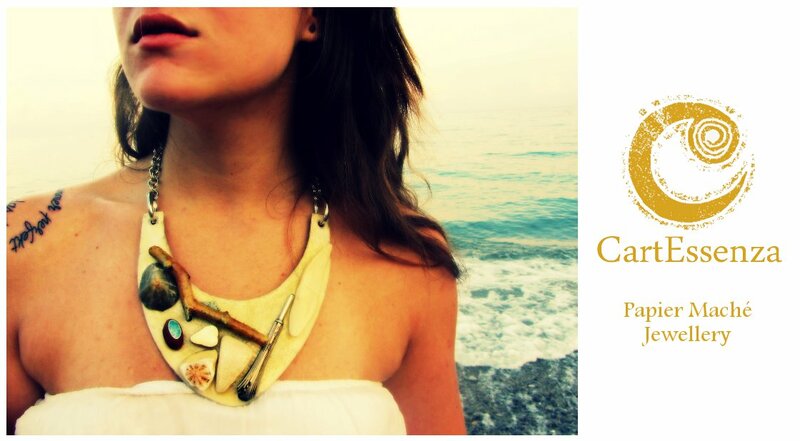 CartEssenza's Online Shop: finally open! Papier maché necklace "Pink Swirls"